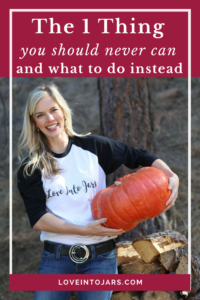 Canning pumpkin seems like a lovely fall preserve, but it isn’t advised. This post will explain exactly why not, and will explain the safest way to preserve this fall flavor. This subject undoubtedly will bring about cries from readers who will say truthfully that their mother, grandmother, and great grandmother have been canning pumpkin puree for years and no one has ever gotten sick. To them I will say that I am truly happy that they’ve never gotten botulism. That would be a real bummer to have diarrhea for a week, or worse, if you were elderly or had a compromised immune system. One of my favorite college professors specialized in food, culture, and literature. She taught me a lot about how strongly people feel about their food and the love that goes into preparing it. I showed up to every single one of her classes at 8 am on Friday mornings in Taylor Hall of Chico State, even though Thursday nights were a very fun night indeed and I would have much rather slept in because she was such a great teacher. She shared example after example of how we eat what we eat, because of our mothers, because of our geography, and because of our husbands. It all made perfect sense to me, and her early morning lessons really ring true now that I’m blogging about canning. I had a follower on social media recently reference the 1973 edition of the Better Homes and Gardens Canning Cookbook when she stated that she was following the directions therein to can pumpkin puree. I’m sure that book had great directions for doing so…44 years ago. I too love reading old cookbooks for inspiration and using recipes that my great grandma used- those old recipes make me feel genuinely connected to the women in my family and the recipes are usually dang good! But here’s the problem. Canning science has improved in the last 44 years, and the latest recommendations by the USDA are that you CANNOT safely engage in canning pumpkin puree. I could not, in good conscience, suggest to any reader, that they preserve pumpkin puree based on that science. Pumpkin is a low acid vegetable. It is also very dense. Even in a pressure canner, which gets over 220 degrees, it is too dense for the heat to reliably penetrate the puree to kill any potential botulism spores. Don’t worry, new canners; there are VERY FEW items that you cannot preserve in a home canning setup and this is one of them. Truly, very few. And, just like when you bake bread, you don’t have to understand why or how the bread rises. You DO have to follow the directions in order for it to work. Canning is the same. You just have to follow the directions. All foods have an acid value, which I explain in detail in this blog post at my sister site, The Domestic Wildflower, and I suggest you check it out to learn more! Cubed is required because a trusted recipe TESTED the size of the cubes (1 inch by 1 inch) and measured the heat inside those little cubes to be sure that it was hot enough inside to kill the spoilers that would make you uncomfortably sick. It is for this reason that you cannot ever can spaghetti squash at all- it won’t hold a cube shape and becomes a mushy mass that the heat, again, can’t reliably penetrate. And, doesn’t that sound super unappetizing? Cubed winter squash must be peeled first, which seems like a colossal chore to me personally, but it can be done. So, what should you do if pumpkin is your favorite fall flavor and you want to preserve it? It can be frozen, and I’d recommend these wide mouth pint jars for freezing. You can check this page on the USDA site for more detailed, and tested by science specifics on exactly what you can and cannot do with pumpkin. I have several easy, safe recipes that you should check out. Try the Strawberry Rhubarb Syrup, or the Ranch Style Salsa (very few ingredients- so easy!). If this post was interesting to you, you’ll learn this type of thing and more in my new book, Love Into Jars and I hope you’ll sign up to the waitlist. That way, you’ll get sneak peeks, exclusive content, and be the first to know when the book is available for pre-order!